This Etsy jewelry maker will be showing off her best handmade pieces this year. But, prior to making jewelry, Rachel Lynn from Rachel Lynn Studio was inspired by the 70 horses she looked after. 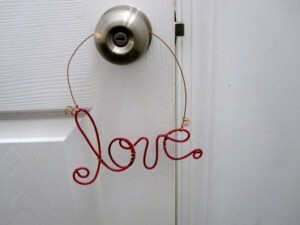 Now she only cares for her two dogs but still makes beautifully crafted pieces from wire, fabrics and paint. And I really love the personalized wire name hanger which would be great for any baby shower, house warming gift or even in your own home. 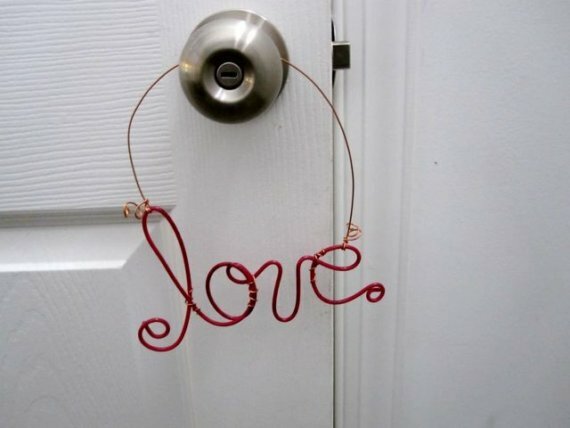 I was actually just at an event last week where Rachel was and I saw the “love” wire door hanger and I thought it was a necklace… I asked her if she could change the clasp and make it a necklace for me, so I can’t want to get that! How eyecatching would that be with an LBD and red heels… OH! On Valentine’s Day?!? AH! I’m really excited now! In my book, a great handbag is a girl’s best friend. It’s like a puppy you don’t have to feed. I know I’ve told you about DeGroot Handbags before, but in case you don’t know, DeGroot bags are made by a local gal, Missy DeGroot, who specializes in high-end Italian leather handbags. I reeeeeeeally love her bags. Don’t tell my husband, but I have four and I’m contemplating making it an even five. : ) So, naturally I can’t wait to see the selection of handbags that DeGroot Handbags will bring to Seasonably Chic Showcase. Here’s a little backstory on Missy: After starting the line 6 years ago, she’s been traveling the world for the most exotic and unique leather and fabrics. These bags have graced the cover of top fashion magazines such as Lucky, In Style, WWD, Accessories magazine, Glamour, Marie Claire and Elle. After selling items on the road throughout the Midwest, founder Brenda Stradley realized there was a huge demand for her unique gifts in Mason, Ohio. She set up shop and has been serving the people of Cincinnati with everything a woman could want. It’s In The Details carries some great girlfriend gifts and head turning trinkets. They sell everything from accessories, to shoes, to kid’s clothes, to wedding gifts. The boutique also has a wide selection of antique style jewelry at great prices. Below are some of my favorite pieces… they sure will make a statement at your holiday parties right around the corner! I love using candles around my house. You can get that scent of warm, baked apple pie without even stepping in the kitchen! haha! That’s why I am looking forward to stopping by Scentsy Warmers’ booth to see all they have to offer. These are no ordinary candles, my friends. They actually aren’t even candles, they are a low-watt bulb that melts specially formulated wax slowly, maximizing the fragrance time. Each Scentsy comes in a Warmer which can be customer designed. They feature some beautiful colors, shapes and sizes. You could find a Warmer that matches any room in your house. The Seasonably Chic Showcase will be on Nov. 6 at The Phoenix downtown from 10am-3pm. This event brings 40 of the Tri-state’s best boutiques and vendors – for women, men, children and pets – all under one roof for one day of spectacular shopping! The best thing about it? It’s free to get in! Just bring in a canned good for the Freestore Foodbank! Click here to RSVP! Cincy Chic and Locals on Living, an affiliate of the Cincinnati.Com network, have teamed up to give away a prize pack of items from all the Seasonably Chic Showcase vendors that’s valued at $2,500! Click here to learn how you can win it! PS: thanks to my intern, Holly Hoover, for helping me put this blog together. Big Sale on High-End Handbags! I got an email from one of my favorite local handbag designers, Missy DeGroot. 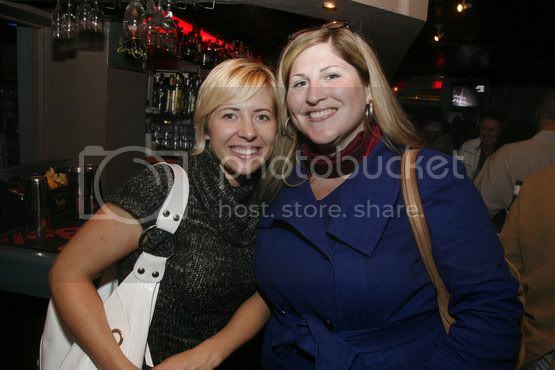 Not that there are a ton of local handbag designers… but she is my favorite! haha! She said she’s having a big sale on her handbags through the end of the day today* on www.enviius.com! So, if you’re in the market for a new bag, I suggest you check out the sale. I’m a die-hard DeGroot bag fan. I purchased my first one two years ago. I used it every day for an entire year and I finally needed a new one. I bought my second one and I’m going on MORE than year, literally using it every single day. They really are great bags. Here’s a picture of me with my more than a year-old bag. And it still looks the same… and it’s white. Now, that’s saying something. Actually, it says two things: 1) I don’t care about carrying a white bag in winter, fall, spring and summer… and 2) that DeGroot Handbags are the best bags EVER! *UPDATE: After I posted this blog, I sent it to Missy. She sent me the below email indicating the sale has been extended due to this blog (see below)! WOOHOO! the weekend!!! 🙂 Thanks a ton!!!! When you think of Kenwood Towne Centre, big box stores probably come to mind. Nordstrom, Macy’s, Forever 21… etc etc. Well, next weekend, KTC is letting the independent designers take over! I’m so excited! Ok, here’s how it happened. About a month ago, I got an email from someone at KTC and she said she wanted to do a shopping extravaganza, but use only local designers. I was in love with the idea, so I scavenged through my little black book for local designers and emailed them all. Many of them were able to participate, so “Indie Collection Cincinnati” was born. See below for more info about the event, but the gist is that local jewelry, handbag, accessory and clothing designers will be at Kenwood for one weekend only. These are my favorite designers ever (Degroot Handbags and FENNO Fashion are two of them that will be there.) This has never been done before. It’s your chance to get that Mother’s Day, Graduation, or I’m-so-special-I-deserve-a-gift Gift! Handbags are the ultimate accessory in my book. I don’t wear a lot of jewelry because my bag is usually loud, large and in charge. I also don’t like to change my handbag much. I find it time consuming and annoying. And I usually forget things like my wallet or lip gloss in the rushed bag change-over. So, the whole handbag debacle has been a thorn in my side for a while. How can I find a bag that meets my form and function needs… and happens to look fabulous with everything? Miche Bags are a good option. Especially their hobo style because I tend to lug everything but the kitchen sink with me in my bag. But even changing the shell is too much hassle for me. But then I met Missy DeGroot. She’s beautiful, ambitious, talented, successful – but still Cincinnati’s best kept secret. She’s a local handbag designer who started her own company (DeGroot Handbags), designs all her own lines and manages relationships with retailers such as Kitson, Fred Segal, Saks and Bloomingdales to get her bags on their shelves. I met her about a year ago and got a white Isis Tote. I wore it every day for a year and a half (yes, I snubbed the “don’t wear white in winter” rule, and it felt good!). To work, out with friends, on weekend getaways. That bag went everywhere, through everything with me. It carried computers, doggie treats, coffee mugs, water bottles, notebooks and champagne bottles. I consistently got compliments on it. It went with everything. It was exactly what I needed. So, when it started to fray and look a little worn out, I gave Missy a call. She said I had perfect timing because she just got in her new collection. So, naturally, I told her to bring her wares to the office and I’d do a little blog on her! Check out the video below to see my new white grommet hobo bag, learn about all the new colors/prints/styles she’s introducing with her new collection, and virtually meet the amazing Missy DeGroot!